Yesterday, John Irving was in the city for the Ottawa International Writers Festival‘s last event of the season. It didn’t start on a good note though: when I arrived, I was told that the author would not be signing books and that the audience would need to submit their questions in advance for approval. The public could buy a limited number of signed books at the entrance, but there was no way of having them personalized. Then, the event started 25 minutes late because the host, Adrian Harewood from CBC, was not on time. Thankfully, the rest of the evening went much more smoothly. 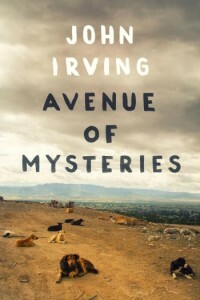 At the beginning, John Irving read an excerpt of his new book, Avenue of Mysteries. He then proceeded to talk about his work and told us the idea for the novel came to him more than 25 years ago when a friend of his, who was a photographer, showed him pictures of child performers in circuses in India. He decided to go see them for himself and lived with an Indian circus for a while. He was originally planning to write a screenplay on the subject, but the movie project was rejected by the Indian government because it reflected badly on the country. Then the same photographer showed him other pictures of children in the slums of Mexico. The author got the idea of having the main character, Juan Diego, live in the city dump as a child with his sister and later, as an adult, travel to the Philippines to accompany a friend whose father died there during WWII. At this point, John Irving decided the story would be better as a novel. The author has been heavily influenced by his mother, who was a feminist and activist. She inspired him to write about marginalized people. In particular, he is interested in stories of children at risk, and moments so traumatic in a young person’s life that it changes them. He also likes to write about what he fears, what he hopes will never happen to him or his children. Usually, John Irving sees the ending of his story before he even puts pen to paper. Sometimes, he has to wait from 5 to 8 years for the whole tale to take form in his mind. While the idea for Avenue of Mysteries came to him 25 years ago, he only started writing the book at the end of 2010. It then took him 3 years to finish it. Incidentally, it is the first time he wrote a novel so fast, as usually, it takes him 4 to 5 years. Throughout the interview, the author talked slowly and eloquently, choosing each word carefully. You could almost see the wheels turning in his head. What started as a letdown ended up being an enlightening glimpse into the mind of a very talented author. When John Irving first decided to be an author, he wanted to be a 19th-century writer because he loved authors like Charles Dickens and Herman Melville. Kurt Vonnegut was John Irving’s mentor, teacher, and friend, but the two writers were very different. The late author wrote short sentences, and his books were about the future, while John Irving writes long sentences and his novels take place in the past. Indeed, Kurt Vonnegut repeatedly made fun of his protege’s use of semi-colons. John Irving is also friends with Stephen King, and they believe that they both write horror stories in different ways. The author is currently writing a screenplay to adapt his novel, The World According to Garp, as a TV mini-series. 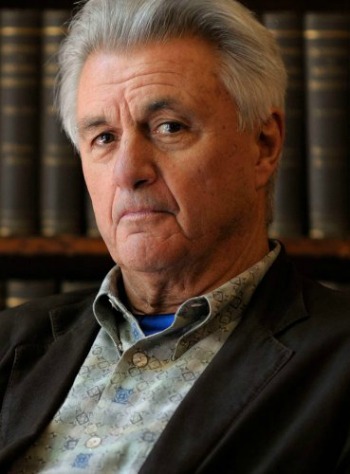 About the author and his work: John Irving’s Website.